There I was bumbling along at 40mph or so. Unlit B road at 7:45pm and a deer loped out in front of the Honda (my wife's). 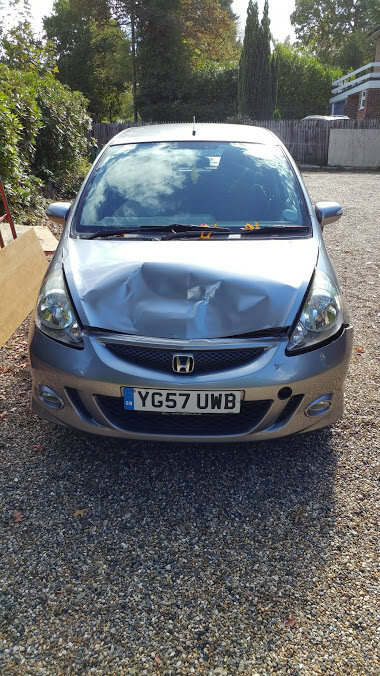 loads of damage - condenser shot, bumper cracked, headlight brackets damaged, bonet fubar'd, intake manifold fractured, slam panel back 4", airbox dislocated from intake and probably more. So it's a write off. When we bought it, we needed something reliable, frugal on fuel, cheap to insure (I was a mere 27 years of age at the time) and with ISOFIX. This was perfect. But now I'm less fussy. I no longer chase MPG numbers and overall reliability is less an issue rather than how easy a car is to work on, ready availability of parts and support, and the feel of the drive. I was ready to change. 66K mile 2003 Jaguar X-Type SE Plus in Zircon Blue with obligatory cream leather interior, which is virtually unmarked. Electric heated seats, cruise control, sat nav, climate control, parking sensors, 3.0L V6 Auto with overdrive/sport mode. MOT until April next year, good service history (missing a few stamps), ARB bushes and droplinks need sorting, but the previous owner was very honest about the car's flaws. No underbody rust (which is a bit key being fair). Centre caps need replacing and it could do with a machine polish but all in all it's a hell of a lot of car for the money and everything works. Nearly got an X-Type estate instead of my 2nd diesel 9-5. It just felt a bit snug under the armpits by comparison, otherwise I might have strayed! Looks pretty good for £1500 and if you are unlucky enough to have a major problem with the gearbox you can afford to write it off to experience. It looked rather surprised, I notice. Sorry to see what happened to the Honda. The Jag looks alright, big seats, auto box, should imagine you go over the bumps very smoothly. Prefer the X-type to the S-type. Oh dear.... Oh Deer oh Deer. What do you call a blind deer you have just run over? Before I got the saab I was looking for a good x type. Gave up in the end and stumbled across the 9-3. Cheers all. I have the deer strike on dashcam as it happens and I've uploaded it for your viewing pleasure. It's a cheap dashcam and the lights of the oncoming cars adjust the exposure enough to make it look like my lights are off. When i hit the deer, the lights do go out for a second. From the video it looked like a light hit, after seeing the car it was obviously not. You're correct on both counts in a way. The Honda weighs just over a metric ton, which is fairly light. The lighter weight is partly achieved by the vehicle's size and partly through thinner materials. The deer was perhaps 90kg (which isn't heavy in the car world).